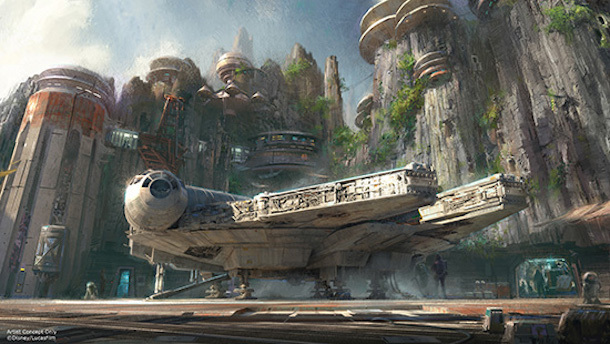 The Disney Land 60th Diamond Celebration gives us a first look into Star Wars Theme Park. Great News for Star Wars fans of all ages appeared in tonight’s Disney Land 60th Diamond Celebration. Harrison Ford took the stage to discuss the wonders of being apart of the Star Wars Universe and introduced to the world the exciting theme park coming to Disney Land. “Star Wars is, for a lack for a better word, awesome.” says Harrison. The Star Wars Experience is a project made by Disney and Lucas Films to create the ultimate Star Wars Theme park. Attractions will include tasting treats from other alien races and galaxies in an other world market, stopping by to relax at the nearest Cantina, and partying at a Star Wars inspired Club. 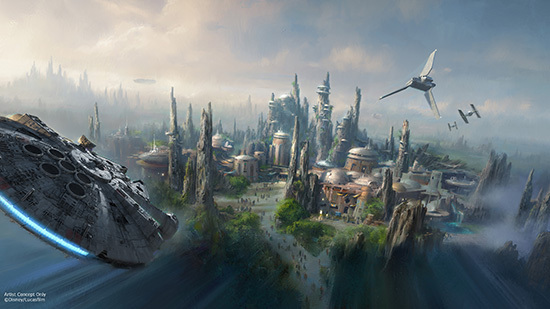 Jumping in the most notable Millennium Falcon on a ride through hyper space and experiencing battles with The First Order and The Resistance will be other experiences for Disney Park adventurers. No standing release date was announced but the park is said to be coming soon. The Star Wars portion of the show didn’t end there with a sneak peak into the newest Disney Park. Star Wars live in concert preformed with the help of BB8, the newest droid to join the Star Wars universe. Rolling out on stage, BB8 projected a scene from The Force Awakens where characters Rey and Finn met Han Solo and is told the truth about the Force. The first Hologram of Carrie Fisher’s Princess Leia projected right of stage along with scenes from A New Hope as the iconic John Williams London Symphony Orchestra played together with the collage of movie scenes. The entire audience turned into a sea of lightsabers as the final scenes from Star Wars Live in Concert ended with the final fight between the evil Kylo Ren and Rey.